Most people are completely shocked when they find out we don’t own a rototiller…and never will. The most common misconception about a rototiller is that they save time – and that you need one in order to have a great garden. It couldn’t be further from the truth. In fact, you can save a tremendous amount of money, time and garden work by not owning one. That’s not a misprint – in addition to the cash saved by not having to purchase and maintain a tiller – you really can save time and work by not having one at all. A rototiller can cause a great deal of harm to a garden’s soil structure, which in turn creates more than their share of weed and maintenance problems for the home gardener. 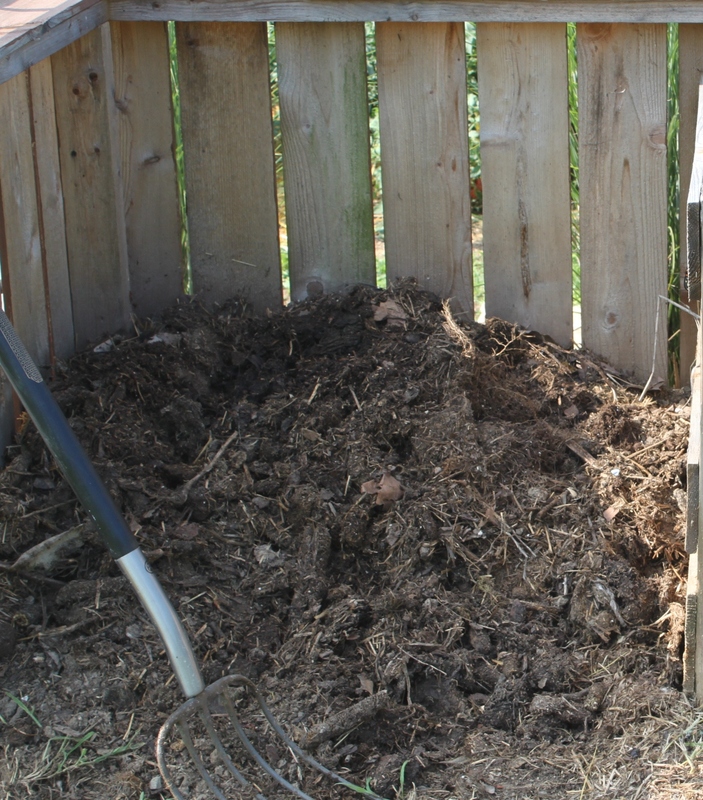 Good healthy soil takes on the components of good compost – teeming with all types of microbial life and structure. Good healthy soil is all about its structure. Great soil should be teaming with all sorts of organic matter in various stages of decay. Those little bits and pieces of organic matter allow for water, air and nutrients all to be carried down through the soil to your plants. Great soil is filled with billions of helpful bacteria, worms and microorganisms that play important roles in bringing nutrients to your plants. Tilling the soil can ruin all of that. As soil is tilled over and over, that all-important structure is destroyed. The active life in the soil is disrupted and exposed – and it becomes reduced to lifeless fine grains of sterile dirt. Without structure – the soil also becomes easily compacted around the roots of your plants – keeping out vital nutrients. That makes it harder for water and air to get through – resulting in under performing plants. Poor structure also makes it difficult for the soil to retain moisture – also a critical factor in a plant’s growth and success. And last – whether you have a rear tine tiller, front tine tiller – you still have to walk behind it or beside it – compacting even more of the very soil you are trying to break up. Rototillers actually cause more weeds than they ever come close to eliminating. When a tiller is run through the garden rows or walking rows – every time those tines flip that soil, guess what else they are flipping? That’s right – hundreds if not thousands of tiny weed seeds. Seeds that have blown in from all over. Seeds that can now be buried under enough soil to have a chance to germinate – and double if not triple the amount of weeds you had before you ever ran those tines in the first place. Thistle and quack grass are a big problem in our area and we are often asked how are garden seems to stay free of them with little work. The answer – we don’t own a rototiller. Barren soil makes it easy for soil erosion to occur, and for weed seeds to blow in. Cover crops solve both problems. Here is another simple fact – bare soil in your garden is not a good thing: In fact – in our garden – during all four seasons – we try hard to never have any of our garden soil or the row’s exposed. Why? For a couple of reasons. Exposed, barren soil is primed and ready for two things…fresh weeds seeds to be blown in and become established – and wind and water to wash it away quickly through erosion. 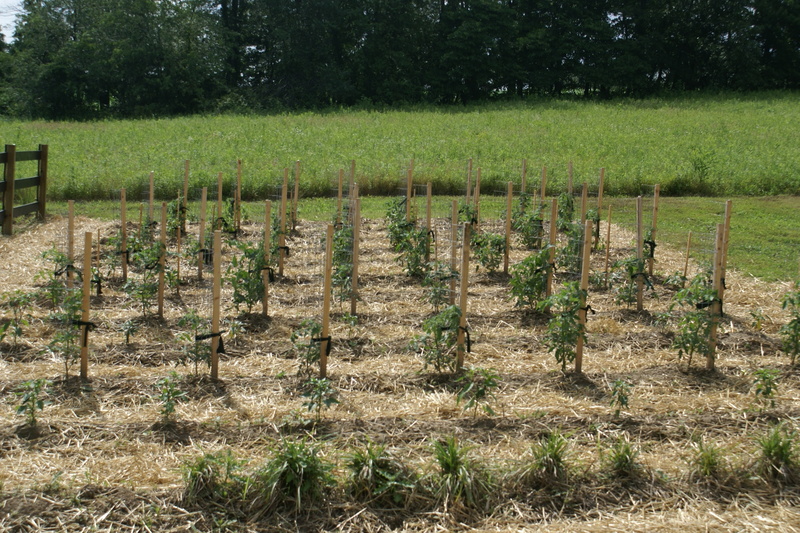 We use large amounts of natural mulch like straw and shredded leaves in the rows and around our plants to keep the soil covered and mulched – keeping weed seeds from becoming established and erosion to a minimum. In the fall and winter – cover crops then take over and provide protection. I know that a lot of people think that those nicely tilled rows between the garden are a neat “clean” look – but they really lead to more weeds each season – and a huge loss of topsoil due to wind and water erosion. How many times have you heard someone say – “I couldn’t even get my tiller in the soil until late Spring because it was so wet.” With a no-till approach – your soil structure drains better, can be worked sooner, and leads to earlier harvest times. Not only that – but tilling at the wrong time can do serious additional damage to your soil structure. If it’s too wet – it can result in clumpy and muddy soil. 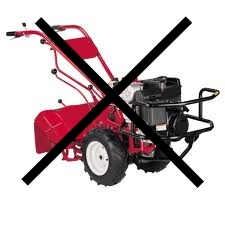 If it’s too dry – a rototiller only serves to destroy the little soil structure remaining – making it less likely to hold in moisture and nutrients. That in turn leads to the need for more watering and probably having to add synthetic fertilizers to the soil to make up for the lack of naturally available nutrients. It becomes a vicious cycle that only causes more work for the gardener. 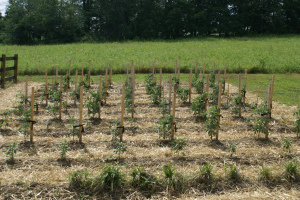 Our low maintenance raised row garden requires about 10 to 15 minutes a day to keep weed free. No matter what type of garden you have – a raised bed, raised row, or traditional garden plot – the more you can leave your soil alone and undisturbed – the better off your plants are, and the less overall weeds you will have. We are big proponents of raised beds, or in our case, raised row beds (raised soil without wood or metal sides). 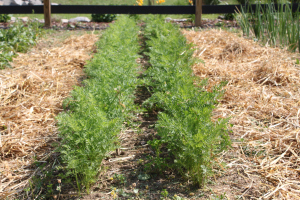 The benefits of raised beds or raised rows are that you only need to work the soil you plant in – and can concentrate adding organic matter and cover crops to that small portion – leaving your walking and maintenance rows for just that…walking in. There is never a need to till the soil in the walking rows, and you can keep weeds out with thick layers of organic mulching materials such as straw, grass clippings or shredded leaves that keep the garden looking neat and healthy – and require little work. 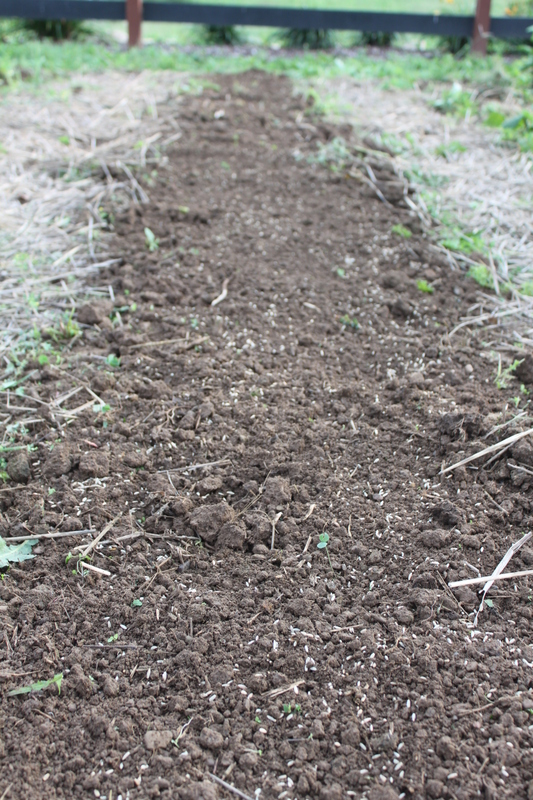 The soil in our actual planting rows is only about 18″ wide. This allows us to concentrate all of our soil building work in just that area – and not wasting effort and hard work all over the garden. 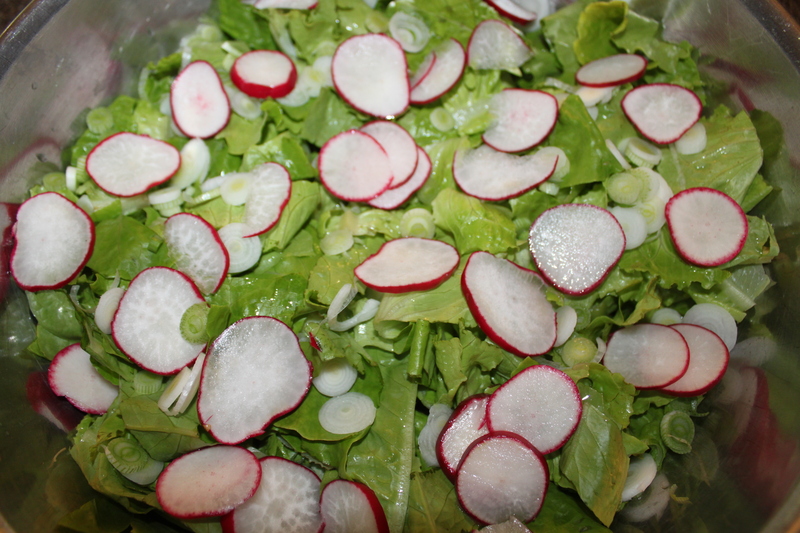 Why dig in and use up valuable compost or cover crops in the rows used only to walk in? Now you can put it exactly where it’s needed – right in the soil where your plants grow! Even our fall and winter cover crops are only planted in the 18″ wide raised rows – not the entire garden – allowing for maximum replenishment of the garden while conserving our cover crop seed.